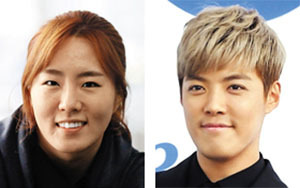 Olympic speed skating champion Lee Sang-hwa and singer Kang-nam are dating. Lee's management agency said Saturday, "The two confirmed they have been in a relationship for some six months." They first met while appearing in SBS' survival show "Law of the Jungle" in September last year. Lee is the world record holder in the women's 500-m speed skating and won two Olympic gold medals in the event in 2010 and 2014. She also won the silver medal at the 2018 Winter Olympics in Pyeongchang. Kang-nam, born to a Japanese father and a Korean mother, made his debut as a member of hip-hop group M.I.B. in 2011, and is an active TV personality.